Traveling with luggage can be burdensome, especially if you still want to see some sights in your destination before a late-night flight but you've already checked out of the hotel. However, finding a secure place in Vancouver to stash your suitcase doesn’t need to be a hassle. A small number of locations offer baggage storage services, and most hotels have storage facilities departing guests can use on their last day in the city. If you're traveling to Vancouver by train or bus, you'll likely arrive in the city via the Pacific Central Station, which offered short and long-term luggage storage for passengers until 2015, when the city's transit authority closed the storage facility for safety reasons. 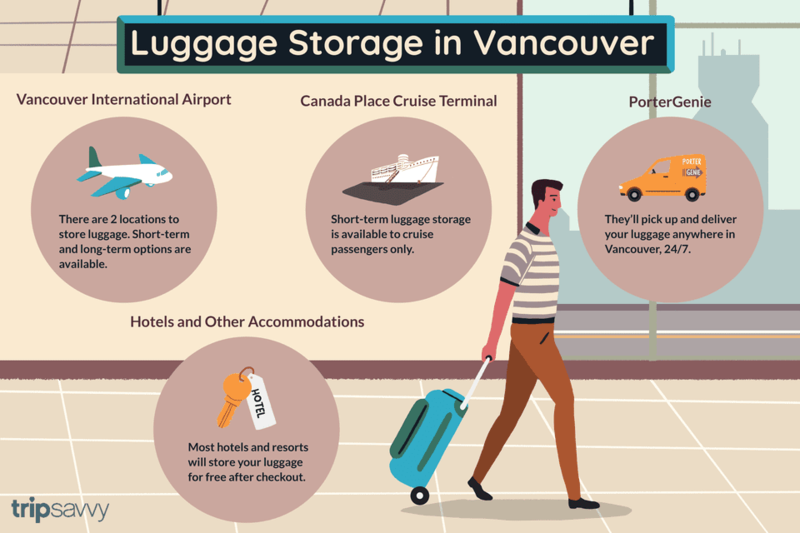 Whether you have a Vancouver layover, a west coast cruise, or a quick visit planned, the best places to store your luggage include the Vancouver International Airport, Canada Place Storage, the PorterGenie App, and at many hotels and accommodations after check-out. If you're stuck in the city on a layover flight but want to explore Vancouver while you're in town, the Vancouver International Airport (YVR) is perhaps the most convenient spot in the city to leave your luggage. There are two facilities on site that will store your bags for you for a small fee: the CDS Ltd. Baggage Service and the Priority Baggage service. These two options offer long-term storage options as well, which makes it a great place to store things for a few days if you plan on making a weekend camping trip out of the city. There are storage options in both the domestic and international terminals in the Vancouver International Airport, all of which are before the security checkpoint. CDS is located on Level 2 of both the international and domestic terminals, but Priority Baggage is only available on Level 3 of the international terminal. When traveling to Vancouver on a cruise ship or private boat, you will most likely dock at the Port of Vancouver, which offers short-term luggage storage through CDS Baggage Services at the Canada Place Cruise Terminal. Located in downtown Vancouver, the Port of Vancouver is a multi-purpose facility offering a five-star hotel, the FlyOver Canada attraction, and cruise and ferry services. You'll also be relatively close to the world-famous Stanley Park and many restaurants, shops, and music venues. If you'd like to explore the city unencumbered, checking your bags at CDS Baggage Services will free you up to see more of Vancouver. However, the CDS Baggage Service at the Port of Vancouver is only available to cruise passengers; if you're arriving by other means, you'll have to look elsewhere to store your things. No matter which way you come to or leave the city, PorterGenie will pick up and deliver your luggage anywhere in Vancouver—24 hours a day, seven days a week. Even if you're staying in Richmond in the south, Burnaby to the east or Lynn valley in the north, PorterGenie's storage service area covers most of the Vancouver Metro Area. PorterGenie offers pick-up and delivery services at airports, cruise ship terminals, hotels, offices, ferry terminals, train stations, bus stations, and even homes. You can book your reservation for pick-up, storage, and delivery online and track your luggage in real-time via e-mail notifications for one flat day-rate. Since most hotel check-out times are around noon but the Vancouver International Airport is about 30 minutes away from downtown, storing your luggage at your centrally-located hotel may be the most convenient option for people leaving the city with time to kill. Unless you're staying in an Airbnb or private residence, chances are your accommodations will store your luggage for free while you explore the city on your last day in town. Be sure to check with your hotel or resort before you plan around this, though, as some don't have a room or space available during peak tourist seasons.